My process begins with an idea. I have a sketchbook of drawings and ideas. Most of my works are planned, but some are spontaneous and some come straight from the eye of my camera. I have a Canon T2i and several lenses that I try to bring along with me whenever there might be a good opportunity for photos. I also can set up a home studio with a tripod, various lights, and a homemade light tent for still lives. Most pieces require several different reference photos. I try to have the living creature I am drawing right there in my still life to photograph. I take several pictures, sometimes over more than one day which I then stitch together in Photoshop. I color correct, colorize and re-size elements until a solid reference is built. 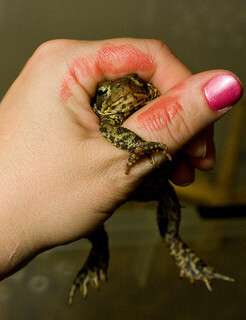 This June 2011 photo was a random shot that gave me the idea – what if this toad had just been kissed by a princess? The next time I was able to catch a toad was August 2011. I lipsticked my hand, painted my short pathetic thumbnail and took several shots. 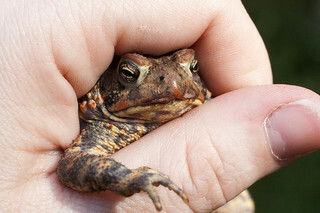 As you can see, I put no makeup on the toad. I then print the composite image on paper twice; once for reference and one to transfer onto the drawing paper. Sometimes I freehand the sketch, sometimes I trace a simple outline of the image, other times I use a grid to transfer the composite to the drawing paper. After the initial drawing is traced onto the Stonehenge, I outline main features and then I begin work on the background. I do several light layers before burnishing with a lighter color. 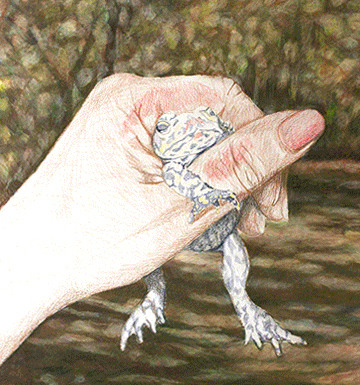 The color of the background may become lighter or darker later in the process, but it is easier to blend the edges of a drawing if the background is blocked in to a burnished finish. The very beginning of this drawing with background sketched in and darkest darks. This is right before burnishing the background, this time with a light French gray. The background has now been burnished with a light color. Details are placed in the main image. Details are soon sketched in. I go over the piece lightly and focus on establishing where the darkest darks will be. 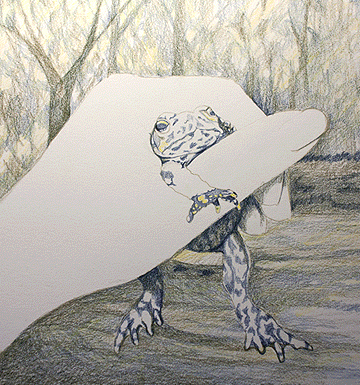 I work in light layers until the drawing is covered in colored pencil. Then I burnish the subjects using white or a darker color for the dark darks. For black or dark brown, I begin layering with brown and come in and add a dark blue to deepen the black. Burnishing blurs everything and leaves it under a layer of white. I come back in over that and add details. Having the entire drawing burnished makes blending the edges between elements quite easy. This is the single most important element of my technique. I may re-burnish an area several times until it is blended in and / or dark enough. Here is a .gif of the process on “The Wrong One.” I think it illustrates the drawing/burnishing/drawing/burnishing technique well. 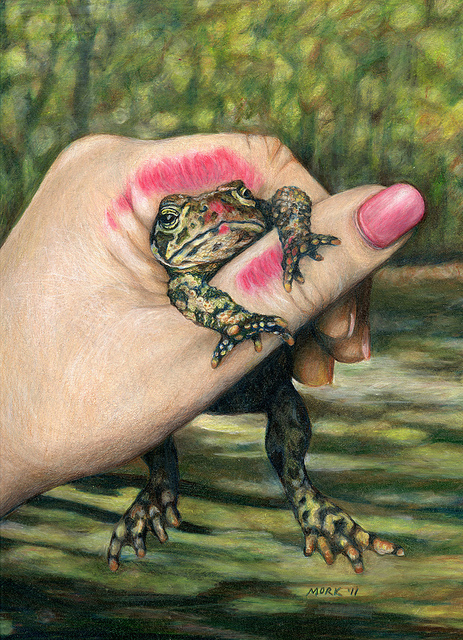 The addition of a second toad arm shows that a piece isn’t ever done until it’s done! You can see that there is quite a large difference between the reference photo and the finished work. My goal is not to copy photographs, but to execute an idea with the aid of photography. The two most enjoyable parts of the process are catching and photographing my models and that end stage of a drawing where I am finishing it and the photo reference is no longer helpful. The drawing takes on a life of its own that I feel transcends the original photograph and is very rewarding. I love to detail and explain my process – there are no secrets, only practice and experimentation. If you have any questions let me know! As far as tools go, I have favorites. I use Stonehenge paper for 99%of my colored pencil drawings. I first discovered Stonehenge for drawing in Basic Studio class in college. It is a tough paper perfect for colored pencil that takes many layers and/or the abuse of erasing. 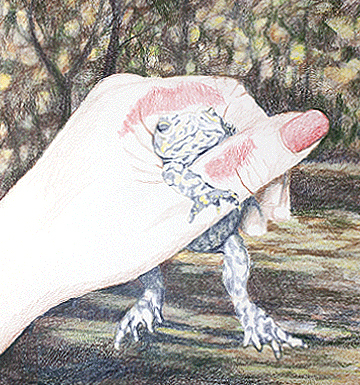 It has become a favorite of colored pencil artists everywhere. I tape my paper to a drawing board. I find with the pressure that I apply in my drawings that I can get carried away and sometimes bend the edges of paper if I am not careful. Taping it down solved that. The colored pencils I use are all rated as Lightfast according to the standards in the Colored Pencil Society of America’s Lightfastness Workbook. I have personally culled the pencils that do not meet their standard and given them to my daughter. She loves them and I love knowing I will not accidentally use a fugitive pigment. My favorite pencils are Caran d’Ache Luminance. They are a superior pencil. I also have used Prismacolor Premier in the past but no longer recommend them as I can not tolerate their breaking. Tools I find helpful are Prismacolor’s colorless blender, Lyra’s Splender blender, Caran d’Ache’s Full Blender Bright, Derwent’s blender and burnisher and Copic and Prismacolor colorless blending markers. Rags made of old t-shirts help blend large areas. I do not usually use solvents in a large scale, but tricky areas can be tamed with the Prismacolor or Copic clear markers.